We’re celebrating Christmas nice and early this year. If you planned on spending your left over quarterly budget on eggnog and Christmas decorations, we’re hoping that you do the responsible thing instead and buy yourself a UXmas present. We called it UXmas because it includes four great tools at a gift of a price. They are User eXperience enhancing tools that will make life easier for you and make your site better, easier and more effective. You get 3 user testing projects for $700, saving $350. If you’ve already got an account we’ll credit the extra time to it. Markup visual designs collaboratively, sketch directly onto images, compare alternatives side-by-side and collaborate and get approval remotely. Rapid collaborative wireframing – design your page layout and focus on your message, your navigation and your interaction before you add graphics. Live chat with your site visitors and customers. Card sorting is a simple but effective way to discover how people think your site content should be organized. Allows you to easily and quickly put your navigation structure into a plain, clickable site. Hopefully that covers all the bases. $1,050 worth of user testing projects (3 studies), for $700, and 12 months access to the three most popular UX tools for free. The UXmas offer will only be available for two days starting on Thursday 15th December, but you will be able to request an invoice/purchase order and pay within 21 days. Please start talking to whoever needs to authorise the payment and any other teams that may want to use the bonus tools. The More You Tweet, The Bigger The Discount – Starts Today! Want to get Loop11 credits for as low as $11? Well here’s your chance! To celebrate 11.11.2011… Loop11 is offering the usability testing opportunity of the century! Between October 10, 2011 and November 10th 2011, the more @Loop11 tweets there are the bigger the discount will be on November 11th, 2011. You won’t get a chance like this for another 100 years! This promotion starts on October 10th, 2011.Visit our promo page to learn more and Tweet about it. Loop11 will be conducting scheduled maintenance on Sunday July 17th, 2011 beginning at 22:00 PM UTC (Co-ordinated Universal Time), and lasting up to 4 hours. During this time, the Loop11.com website will be temporarily inaccessible. Any content hosted on Loop11.com will not be accessible by you or your project participants. During this time a message will be posted on the Loop11 website alerting visitors of the scheduled maintenance. This is a major service upgrade including database improvements and server updates. 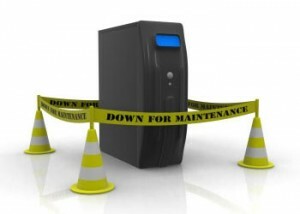 We appreciate your patience and can assure you the service will be restored as quickly as possible. For additional time zones, please reference www.timeanddate.com. We apologise for any inconvenience caused, if you have any queries relating to this notice please email us at Support@Loop11.com. 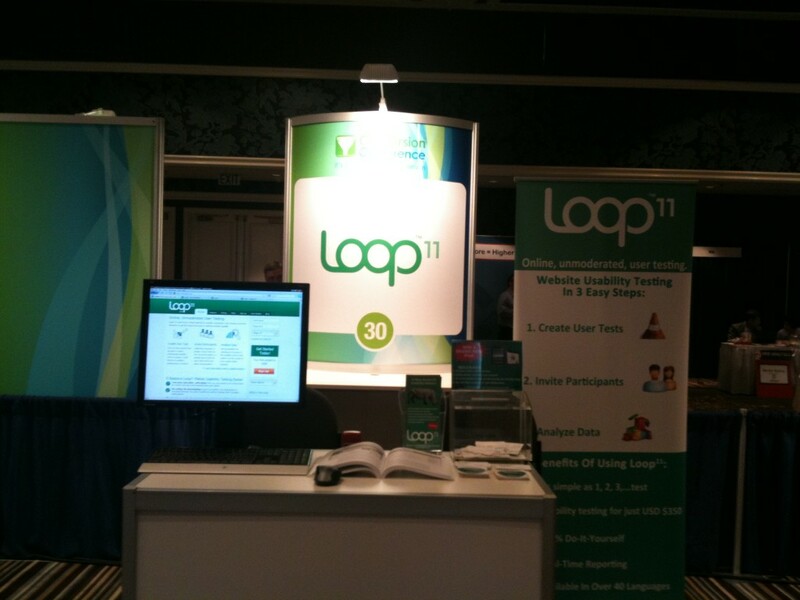 See Loop11 @ UPA 2011 and win an iPad! It’ that time of year again, when usability professionals from around the world converge for a few days to network and engage with the greater UX community. This year UPA 2011 is in Atlanta, Georgia…. 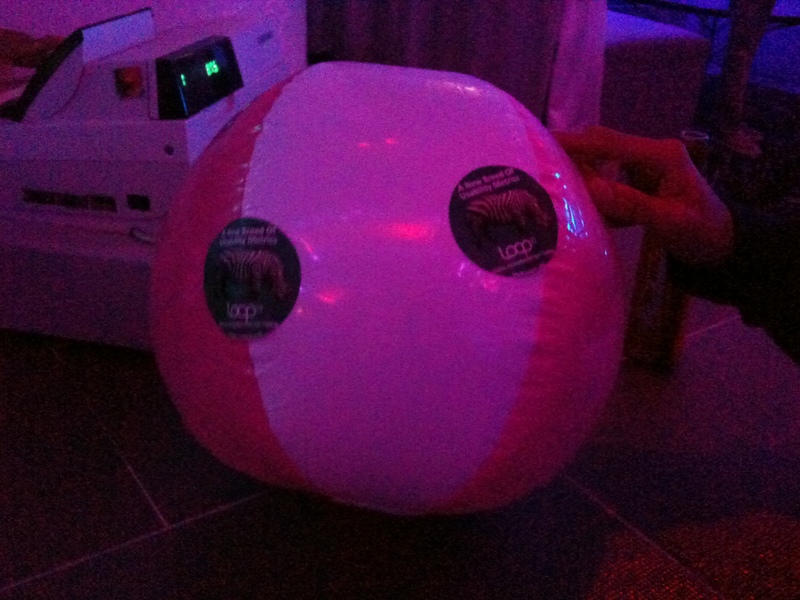 And as always, Loop11 will be there in force, giving away another iPad2 and plenty of stickers. But it doesn’t stop there…. Bill Albert, author of several UX books and Director of the Design and Usability Center at Bentley University will be showcasing Loop11 during his workshop on remote and unmoderated user testing. This a great opportunity for those of you who haven’t tried remote testing or Loop11 to get a demo from one of the world’s industry leaders. Loop11 will be at booth number 2, so pop by to have a chat, try out our iPad usability test demo and grab some stickers for your chance to win an iPad2! That’s right, now you can get the best of both worlds… quantitative and qualitative. There’s a plethora of information on quantitative versus qualitative research methods. Best practice guides suggest a mix of both to effectively capture a more holistic perspective. A challenge, however, is how to combine qualitative and quantitative testing in a productive way to obtain statistically significant usability data to drive user-centered design. That’s where Loop11‘s partnership with TryMyUI comes in. When Loop11 and TryMyUi are used in tandem, designers, researchers and marketers have a powerful set of metrics to optimize the user experience. The difference between quantitative and qualitative research is often explained using contrasting terminology, like “hard vs. soft”, “numeric vs. non-numeric”, “statistics vs. insights”, “measure vs. explore”, “what vs. why”. The quick contrasts are useful to highlight both the strengths and limitations of each approach if used solely without consideration of the other. Broadly speaking, quantitative research can provide path and performance analyses by capturing the “what” of user behavior. Loop11 provides quantitative measures of real user behavior through clickstream analysis. It delivers quantitative metrics such as task completion rates, number of clicks, time on tasks, and detailed path analysis. Data generated from users’ clickstream are automatically presented in real-time reports. In contrast, a goal of qualitative research is to gain valuable insight into the thought processes behind user’s actions. TryMyUI is remote usability testing tools that capture the “voice of the customer” via a video recording and a written summary documented by the user. As users navigate a website, they “think aloud”, verbalizing their thoughts as they complete the tasks or questions posed by the researcher. For example, a user may express surprise to find the “register” button in a particular location on the site. Quantitative research tracks that the user clicked “register” and what the user clicked on before and after. The additional insight that the user was “surprised” augments the analysis of the user’s behavior and the researcher observes this first-hand by viewing the narrated video. Loop11 provides the quantitative measures through metrics and reports, and TryMyUI delivers the qualitative insights via narrated videos and written answers to survey questions. With this easy-to-use, on-demand testing tool, any researcher or marketer can simultaneously gain insight into both the “what” and the “why” of user behavior. Although there is no single usability tool that provides this powerful combination, the combined functionality can be replicated by initiating a project in Loop11 and then augmenting the testing process in TryMyUI. to help you get started and become familiar with the setup process and results. your project copy your unique project URL and head over to TryMyUI. as that information is already captured in the Loop11 project URL. 4: Use the default “Survey Questions” or customize as needed. Select the demographics. Select number of testers. narration. Users will also provide written answers to any “Survey Questions”. Planes, trains and usability conferences. May was a crazy month for us at Loop11. After kicking the month off at the Conversion Conference in San Jose, we came back to Australia for a few days, before heading off to Europe for a whirlwind tour. With the Icelandic volcano wreaking havoc, and British Airways staff going on strike, the odds of us getting stranded were high. However, with some perseverance and ingenuity, we prevailed and made it to every destination on time. We attended the NNG conference in London for 2 few days to exhibit, then whizzed off to Munich for the “piece de resistance” for usability professionals; the 2010 UPA conference in Munich. This was the first time the annual UPA conference was held outside the USA. So we were a bit unsure of what to expect. But it turned out to be a great event, not just for UPA but for Loop11 too. We talked to a lot of usability and IT professionals wanting to know more about Loop11 and giving us very insightful feedback. Based on our discussions with people in Munich, we will be fast tracking some new features and offers to our members. The most interesting thing about UPA 2010 in Munich, is how many people already knew about Loop11 and how many people were seeking us out to give specific feedback, or discuss how they want use Loop11 more in-depth. Maybe the fact we gave away an iPad helped generate a crowd. Congratulations to Maik Klotz for winning our iPad giveaway! Maik was one of the first people in Germany to own an iPad. In the end in May, the Loop11 team spent over 150 hours travelling, talked to over 400 people and watched over 30 in flights movies. It was all worth it, as the events were a rousing success for Loop11, and we’ll definitely be attending them next year. 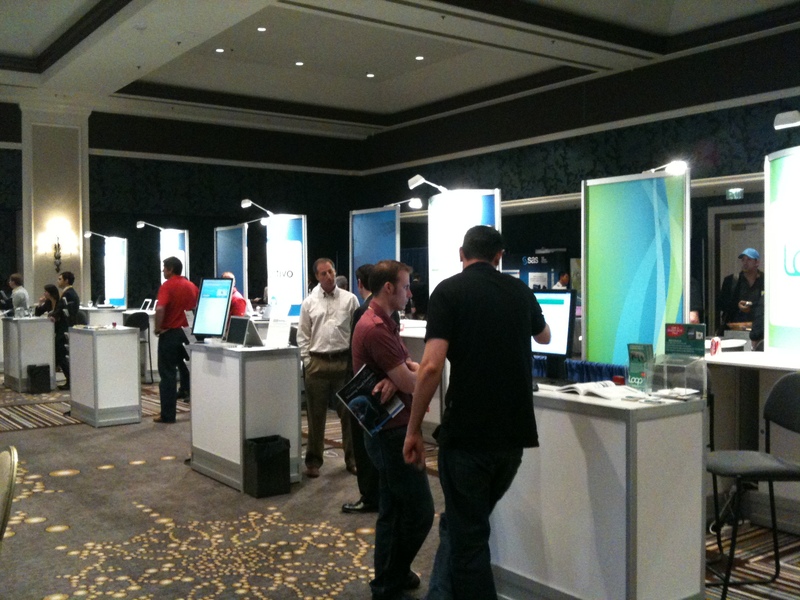 We recently exhibited at the 2010 eMetrics / Conversion Conference in San Jose. It was great being in the Silicon Valley and meeting all sorts of internet professionals. Our booth was a rousing success and the feedback we got was very positive. We even gave away an iPad on the last day. Congratulations to Rob Love from OpinionLab. The event was well organized, and we’ll definitly try to make it next year. Here are some pictures we took of the event. 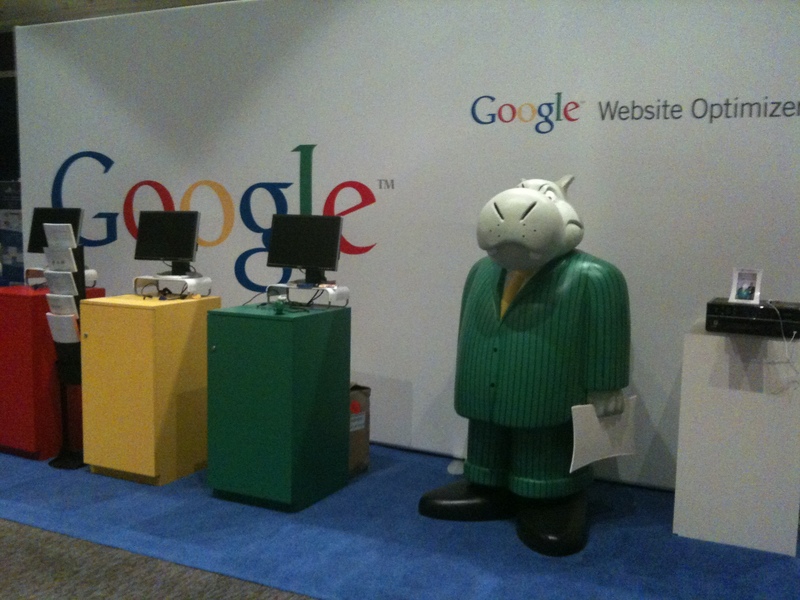 What was with the Hippo at Google's booth? Here’s your chance to come and meet us. Get all the latest Loop11 info and a special “buy one get one free” offer available exclusively to people who visit our booth us at these events. We’re also happy to answer any questions or discuss any issues or feedback you may have. So, if you’re around, pop by our stand and talk to us. We’ll give you all the latest gossip and the special “buy one get one free” deal.